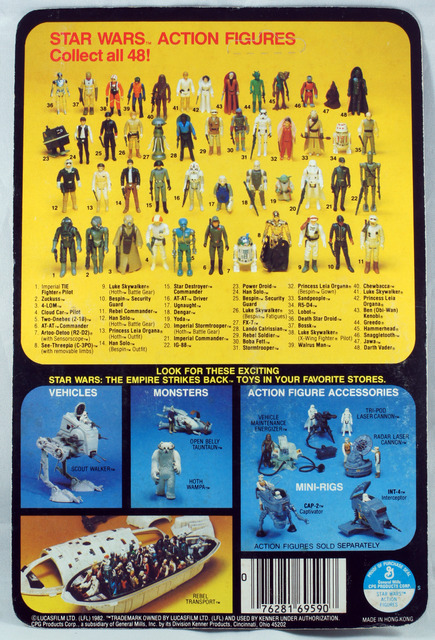 So here’s my guide for all 96 Kenner Star Wars action figures. I will not include variations, (I don’t no either!) this is just meant to be a basic reference guide to which card each figure first appeared on in the USA. This is by no means a guide from my own knowledge, more of a gathering of information from what I have found and other members have corrected from my original post. Description of all 12 figures with artists impressions, instructions how to use the telescoping lightsaber. Also action figure stand offer is displayed at $2, two POP’s. Tie Fighter, X-Wing and Landspeeder pictured. The eight new figures are pictured above the first twelve. Action figure case, Droid Factory, Creature Cantina, Land of the Jawa’s and Dewback pictured. This card Back is virtually identical to the 20 a back, the best way to tell a 20 a from a 20 b is that Luke Skywalker is stood to the left of the picture for the Creature Cantina on a 20 back b. It’s interesting that Kenner released a new card back the 20 Back a, without any of the new figures packaged on that card. Credit to aussiejames for correcting this. Card back shows the first 21 figures, Action Figure Case, Droid Factory, Creature Cantina, Land of the Jawa’s and Dewback. First 31 figures appear on reverse, along with pictures of Snowspeeder, Imperial Transport and Millennium Falcon. Same as 31A but the toys pictured are Hoth Playset, Star Destroyer and Vader Case. The same as a 31 Back b with Yoda pictured to the upper left corner. Slightly different play sets, Hoth Playset, Star Destroyer and Darth Vader Case. Front of the card has the survival kit offer and the back shows all 41 figures with the action figure survival kit offer at the bottom of the card. Display arena offer on the front of card. The back also has display arena offer at the bottom of the card. All 45 figures are pictured on a yellow background. Note there is only one version of the 45 Back and there is at least one known example of 4-Lom packaged on this card. 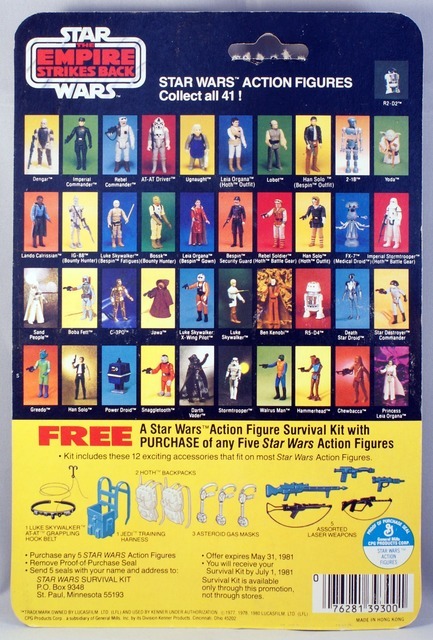 The back of the card shows 48 figures and pictures of AT-ST, Tauntaun, Wampa, five mini rigs and Rebel Transport. There is a known example of 4-Lom on a 47 back card. But sticking to the first card he appeared on the front and back it’s the 48 Back a.
Logray and Chief Chirpa are blacked out. The back also shows pictures of Bandoleer Strap, Y-Wing and C-3PO Case. Reverse of card shows 77 figures and pictures of Rebo Band, Ewok Glider, Ewok Catapult and Rancor. Anakin offer on the front and printed Anakin offer on the reverse of card. Note R2-D2 has a pop up lightsaber and Yak Face does not appear on the back. Last edited by theforceuk on Sun Oct 28, 2018 8:24 pm, edited 32 times in total. Thanks mate, great info is there a guide about all figures which cards they were sold on all over the world ? Pomse2001 wrote: Thanks mate, great info is there a guide about all figures which cards they were sold on all over the world ? Cheers Lars, now that would be some guide, a Palitoy one on here would be good. Aren't some of the 31bk characters only found on B cards? 4 of them I think? Nick_IoW wrote: Aren't some of the 31bk characters only found on B cards? 4 of them I think? Agreed, pretty sure Rebel Soldier debuted on the 31b not 31a, happy to be corrected though. I’ve been waiting to be corrected on something. I will have a look tonight and correct it accordingly, It’s actually not easy to find a guide which specifies exactly which versions they were released on. Thanks for pointing it out anyway. Last edited by theforceuk on Thu Oct 26, 2017 11:56 pm, edited 1 time in total. Thanks for pointing that out, I didn’t even bother checking them just assumed they were 20 A.
Ok I’ve corrected accordingly, the only 31 Back A I can’t find an example of is Hoth Rebel Soldier. I’m going to add photos to this guide, I don’t have all the card backs though so if anyone can help would be great. I’m definitely missing 20B 21A and 32B. Any help much appreciated. Thanks Adam. Thanks very much to Andy (Spoons) for providing 41-A and 48-A photo’s. Last edited by theforceuk on Sun Oct 28, 2018 8:29 pm, edited 3 times in total. theforceuk wrote: I’m going to add photos to this guide, I don’t have all the card backs though so if anyone can help would be great. I’m definitely missing 20-B, 31-B, 32-B, 41-A and 48-A. Any help much appreciated. Thanks Adam. Thanks chaps. If anyone has a any new info on this subject please let me know and I will always look to update the contents. Here are some card backs for you. Thanks Andy that’s very good of you, have placed in line. I should have known you would have the Han Hoth samples, have you tried counting Han Hoths to get to sleep?